The (Hand) Bells Are Ringing. Here we are, playing bells. I’m on the back row in the center of the picture. There are also videos of this on You Tube. 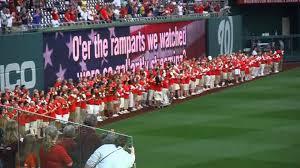 Last August, I joined 541 of my closest hand bell playing friends to play the national anthem before a huge crowd at a Nationals baseball game. The ringers came from over 50 churches in the Mid-Atlantic area. Other groups had done this in other cities at other stadiums, but we put the most players on the field (or actually the warning track: we were warned in no uncertain terms not to step on the grass) to that date. Players and onlookers alike had never seen or heard such a spectacle. The players actually named the bell version of the anthem their favorite of the year. We players had a great time and in fact enjoyed so much we decided to do it again this year, with more players. We rang before the Phillies game last Saturday and, with the benefit of experience, probably played better this time out. A number of people outside hand bell circles have never seen or heard of bells. I’ve played for about 20 years, although that in and of itself doesn’t make me a great player. As with my other musical ventures, I tend to plateau after a few years and in spite of my best efforts, never get any better. To give you an idea of what was involved, we had two rehearsals a couple of weeks before with players in Evensong Bells, our church bell group. The song had to be memorized, which doesn’t come easy to players of a “certain age” (like me). But we memorized it and went to a so-called “cluster rehearsal,” which involved bell choirs located near to each other. That done, we left Manassas about 8:45 AM this past Saturday to be on time for registration at First Baptist Church of Alexandria starting at 10:00. “Massed practice” started at 11:00, the first time the whole group had played together. Obviously, any undertaking involving this many people who have to be in place within a certain amount of time (and more importantly have to be off the field in less than three minutes) requires military quality logistics. Each choir was assigned a color (we were “berry,” a kind of purple) and a number from 1 to 5 indicating our row. So, our designation was Berry 1, and we stood in front of the outfield fence. Row 5 players stood on the warning track, perilously close to the outfield grass. We boarded chartered buses at 11:30, ate lunch on the bus and arrived at the stadium about 12:30. We took 45 minutes to unload our bells and ourselves and then lined up underneath the outfield stands for a run-through at 1:30. We finished that about 1:45 and were on our own until our “call” at 3:15. At that time, we retrieved our bells and stood in order until we filed onto the field to play at 3:55. We recessed in something just over two minutes and thirty seconds, put our bells away and went to enjoy the game. The Nats lost to the Phillies, but there’s nothing like a day at the ball park, even if the heat index is over 100 and the sun is beating down on the stands. We left after the game and arrived home about 8:45, almost exactly twelve hours after we started out. If you’d like to see us in action, here’s a link to the video. Enjoy! I’d do it again in a heartbeat, maybe with cooler weather, but that’s a chance baseball players and fans have always taken. If you think you’d like to learn to play bells and be a part of something like this, give my wife Becky a call at Manassas Baptist Church, 703-361-2146, x291. One word of warning: unless you read music well and can learn bell techniques quickly, count on playing for two or three years before you’re ready to play for the Nationals. I hope to see some of you there in 2017! Yet Another Instance of Synchronicity. Resting in the Everlasting Arms.